1. The non-striking batsman leaving his crease during the delivery in order to shorten the distance to complete one run. 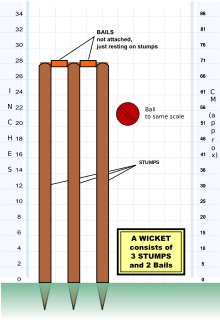 A batsman "backing up" too far runs the risk of being run out, either by a fielder in a conventional run out, or – in a "Mankad" – by the bowler. 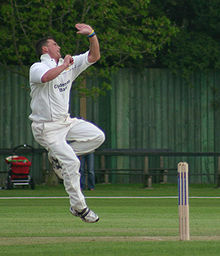 Caught is a method of dismissing a batsman in the sport of cricket. Being caught out is the most common method of dismissal at higher levels of competition. This method of dismissal is covered by Law 32 of the Laws of cricket which reads:A batsman is out caught if a fielder catches the ball fully within the field of play without it bouncing once the ball has touched the striker's bat, glove or only the leg of the batsman. If a batsman could be given out caught or by any other method except bowled, 'caught' takes precedence. ^ "Rules of Beach Cricket". Topendsports.com. Retrieved 2013-08-02. ^ a b c "Hawk-eye innovations". Hawk-eye innovations. Retrieved 2013-08-02. ^ "Cameo – A Cricket Term From". Sportspundit.com. Retrieved 2013-08-02. ^ "Off the mark definition". Sportspundit.com. Retrieved 2013-08-02. ^ "Smith and Ponting get their heads around referrals". Content-aus.cricinfo.com. Retrieved 2013-08-02. ^ "Runners abolished, ODI and run-out laws tweaked". ESPNcricinfo. 27 June 2011. Retrieved 2011-07-25.